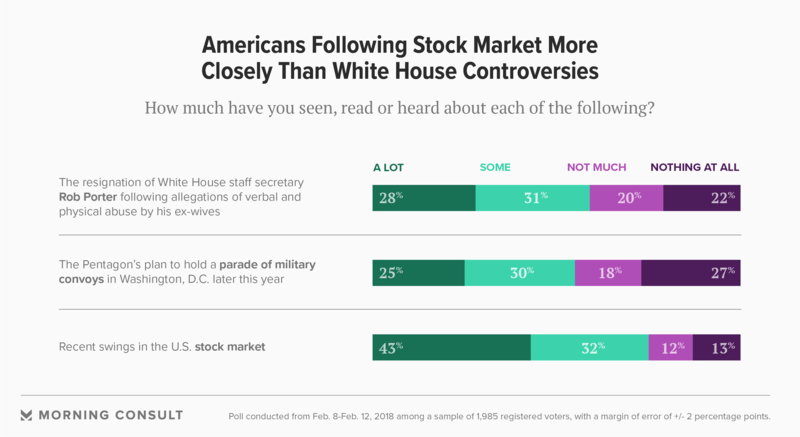 News of stock market declines commanded voters' attention more than a pair of politically oriented issues, a new Morning Consult/Politico poll shows. Photo courtesy of iStock.com. 75% of voters said they’ve heard either a lot or some about the recent market volatility. 59% were familiar with Rob Porter’s resignation from the White House. 55% were aware of President Donald Trump’s military parade proposal. A larger share of voters paid attention to the recently bleak news from Wall Street than to a pair of politically oriented issues that made national headlines around the same time, according to a new nationwide poll. A Morning Consult/Politico survey conducted Feb. 8-12 found that 43 percent of registered voters said they had seen, heard or read a lot about this month’s market sell-off, which included the largest single-day point loss for the Dow Jones Industrial Average and the Standard and Poor’s 500 Index notching its largest weekly percentage loss since January 2016. In comparison, 28 percent of poll respondents said they’d seen, read or heard a lot about the resignation of Rob Porter as White House staff secretary following public accusations that he verbally and physically abused his ex-wives. Twenty five percent registered the same level of familiarity with the Pentagon’s plan, at Trump’s behest, to hold a military parade in Washington later this year. Overall, 75 percent of voters polled said they’ve heard either a lot or some about the recent market volatility, compared to 59 percent who said the same of Porter’s resignation and 55 percent who were familiar with the military parade proposal. The survey of 1,985 registered voters has a margin of error of plus or minus 2 percentage points. Karlyn Bowman, a senior fellow at the American Enterprise Institute who studies public opinion about the economy, said in a Wednesday interview that people pay attention to economic issues like the ups and downs of the stock market “because it affects their families” and therefore is a front-burner issue for voters, whereas issues like the Porter controversy or the military parade can seem trivial in comparison. “It seems like a sideshow right now for many Americans compared to what happens with their pocketbooks,” Bowman said, referring to the recent White House controversies. More than half of U.S. households in 2016 had an investment affected by the stock market, according to Federal Reserve data published in September that found 52.1 percent had at least one retirement account, like a 401(k) or an individual retirement account, while 13.9 percent of American households held stocks. At the same time, stock market participation can vary significantly by state. A separate report published last year by the Federal Reserve Bank of St. Louis found that Mississippi had the lowest market participation rate, at 10.5 percent, and Connecticut having highest, at 26.6 percent. Brandon Barford, a partner at Beacon Policy Advisors LLC in Washington, said in a Tuesday interview that voter attentiveness toward the recent market sell-off could have acute political effects in areas where retail investors are abundant, like the suburbs. Suburban voters appear more attuned to the market swings than urban and rural voters, according to the Morning Consult/Politico poll, which found that 49 percent of suburbanites were aware of the market downturn, compared to 38 percent of city dwellers and 39 percent of rural residents. Michael Madowitz, an economist at the Center for American Progress, said in a Tuesday phone interview that increased public attention toward markets could reflect the 2008 financial crisis and the way it created economic hardships, even for people who weren’t invested in the stock market. “The last time we had a really big crash, in fact it was probably the people who were not in the market who were most harmed by it,” Madowitz said.